I sometimes can't get enough of the sun and sand. They are usually the deciding factors that veto the rest of the options when selecting a short getaway - it is simply a love for the ocean. If you and I have similar travel preferences, you'd be spoilt for choice of beaches in South East Asia. The only thing that would get in your way for that sea-breezed Pina-colada, are the forces of nature - the monsoon and typhoons. Since it's not yet that season, (time and budget on the alert radar), and more importantly the sun had been glorious over the last few weeks, it wasn't difficult to decide where to go for a day. And Port Dickson (PD) it was. Port Dickson is a coastal town located in Negeri Sembilan, 100 KM south of Kuala Lumpur. It's a rather quick 45-minute drive on the busy north-south Expressway to Seremban, and then a 30-minute scenic drive through the palm oil estates on the Seremban-Port Dickson highway. There are many similar destinations in the country, but because of its close proximately to Kuala Lumpur and easy accessibility, PD is positioned to meet the increasing domestic demands for weekend family outings and corporate team building events. It is popular among Malaysians and Singaporeans. If you have some time to spare and a good book to read, try taking the KTM-Komuter train to Seremban and then take a short 2KM walk to the Seremban bus station to get a local bus to PD. It would take you about 3.5 hours from Kuala Lumpur central station to reach your hotel if you don't make any other stops and don't lose your way. Alternatively, there are the frequent inter-city bus services from Kuala Lumpur to Seremban and then hop on to another local bus to PD. I had taken the train route on a few occasions and enjoyed the smooth ride each time — the travel budget – easy on the pocket for a casual traveller. Do book your hotel early if you wish to stay there over the weekend. Even the most basic hotel would charge not ‘so basic prices’ during peak, and most weekends are considered peak hour. Accommodation and food options are plenty to suit any budget. We had visited PD on numerous counts over the years, seen it grow over time from a small town with just a few hotels to what it is today – a place offering a suite of accommodations from a variety of apartments, hotels and backpackers’ hostels. 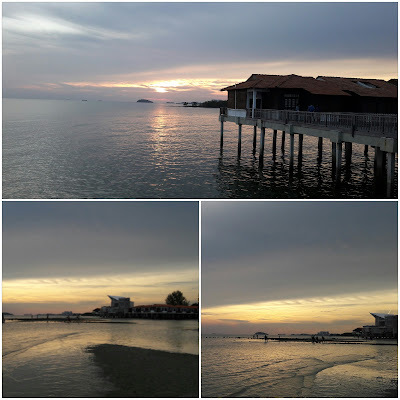 There are a few things to do around Port Dickson. This time around we visited an ostrich farm to see for ourselves these enormous birds up close and personal. 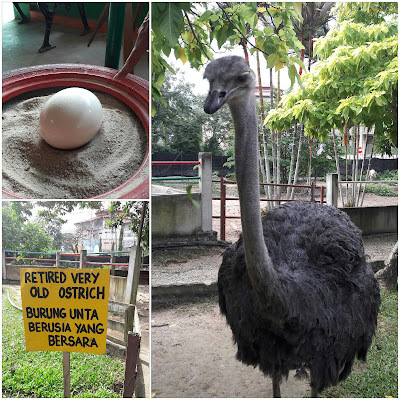 We made friends with the 4-year old Puteri, the friendliest Ostrich on the farm and met some of her other mates including a bunch of retirees. After petting some ostriches, rabbits, and donkeys, we were on the way to see the bird's eggs. Though these weren't laid recently, we still got to see one that hadn't hatched yet. I would say it had an industrial strength shell. I stood on and jumped on it, and it wouldn't crack. My poor foot paid a dear price for that. Some interesting facts, these birds are native to Africa and are the largest living birds today. They can weigh up to 145kg and have very long necks. They do not fly, and no, they do not bury their heads when in danger. Though it was reported that ostriches had been spotted swimming in Australian waters (no one knows how they got there), I didn't see any displaying their swimming talents in PD. If you are curious to know how the bird tastes, the farm does offer ostrich meat dishes in the restaurant. They did not have the coffee I wanted to try on their menu. Today, I am sharing two photo shots. First, one from far away, many miles away from sea level, sandy beaches, and long-necked ostriches. Bedoin. It's a shot taken by a colleague and friend who recently went on a cycling adventure up to Mount Ventoux, south of France. 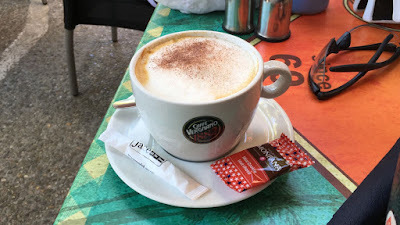 The air here is fresh, and the atmosphere is calm, making the coffee experience a relaxing one. After many hours of cycling uphill to the top, it surely would have brought some relief when sipped. 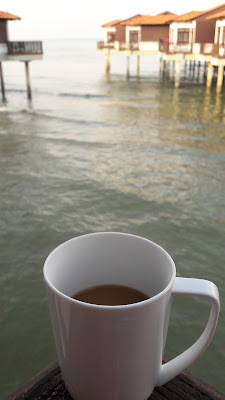 Next is a Get-Up-Uma coffee against the serene sound of waves splashing. Though I could be here forever, eyes closed, listening to the crashing waves - the reality of the coffee smell brought me back from that place far away. The grey waters spoke to me of a hurried world, reminding me to pause a while. While Port Dickson and the ostrich farm may still be here tomorrow, not everything else may. There are so many over-riding priorities and over time, finding the equilibrium that fits one will become a necessity. The night before, the evening clouds cleared up making way for the stars to light up the skies. I am hoping these are the same ones to find that stability. Pause, take your time. Enjoy the coffee.